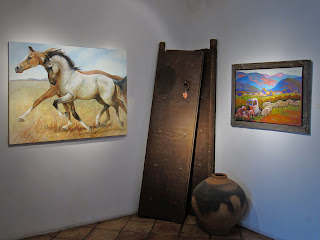 Our latest show opened on March 17 with works by Chaille Trevor and Leigh Gusterson. 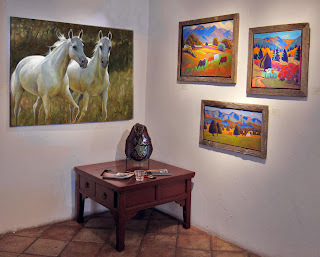 Both artists show a passion for their subject matter – Leigh in her imaginative depiction of New Mexico scenes; and Chaille in her love of horses. 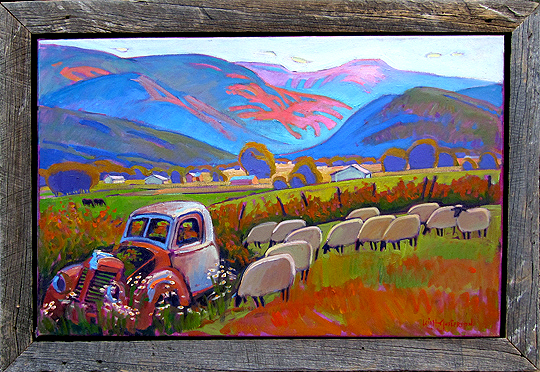 Leigh throws local color out the window; instead she paints what she feels: vivid blues, hot pinks and purples for the majestic mountains and still other bright colors for the fields. 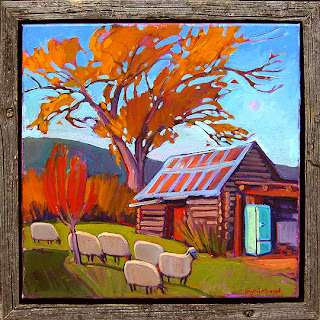 Old cars, sheep in 2-D (they kind of look like flat marshmallows with legs); a rustic cabin with a turquoise refrigerator outside are some of the images Leigh uses in her very personalized landscapes. 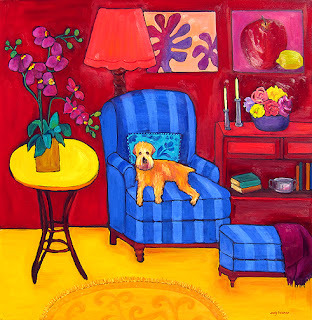 She has an exuberant style and applies her paint generously. Leigh Gusterson "Sheep with Turquoise Fridge" oil on canvas 21" x 21"
Leigh Gusterson "Sheep in the Junkyard" oil on canvas 25" x 35"
Chaille’s painting technique often involves sketching on the canvas first and then applying her paint thinly to produce a translucent, expressive style. Her work shows her knowledge and deep love of horses. She’s been training and showing Arabian horses for many years, and she invites us to know her subjects on an intimate level. For example, in the painting below, the horse looks at the viewer directly and evokes a very emotional response. 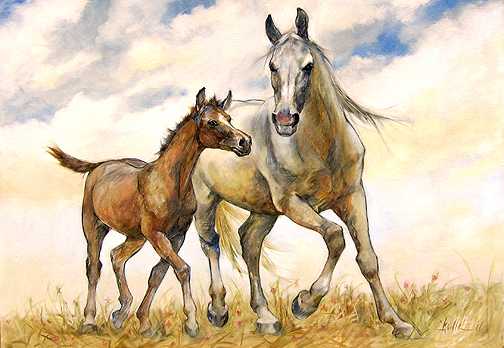 An equally sensitive painting shows a mare and her colt leaning in towards each other, and we cannot help but feel the close bond between them. 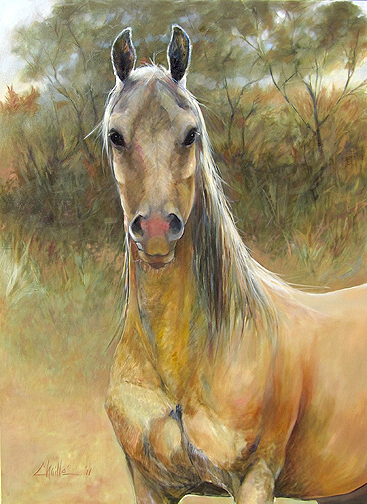 Chaille Trevor "A Day in Spring" oil on canvas 36" x 48"
Don’t rush through his show! Each painting provides a wonderful moment of viewing pleasure! Left: Chaille Trevor "His Prize" oil on canvas 36" x 48"
Right: Leigh Gusterson "Sheep in the Junkyard" oil on canvas 25" x 35"
Left: Chaille Trevor "Kissed by the Sun" oil on canvas 36" x 48"
"Drive up into the Mountains"20"x20"; "Three on Llano" 16"x28"
"Wild Spirits" shows March 17, 2011 through March 30, 2011. The next show is "Live in Color". It features Sherri Belassen and Ryan Hale and starts on Thursday, March 31st. We'll be getting new work by Ryan and Sherri soon, so send us an email for a preview. 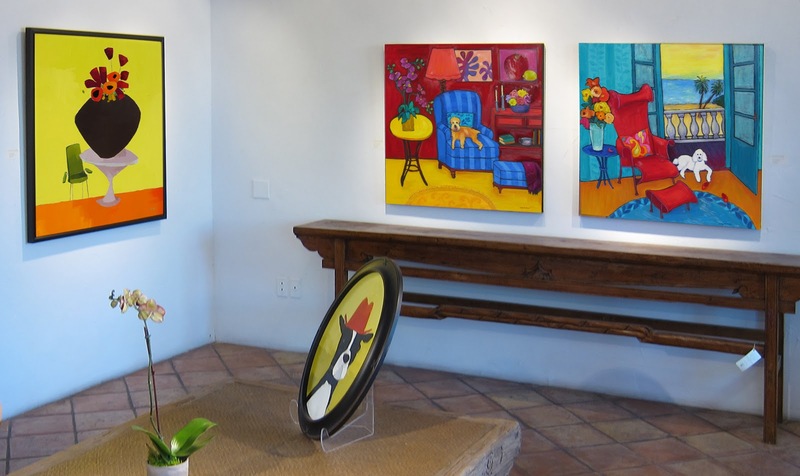 Wilde Meyer kicked off its first of spring shows with an exhibit of paintings by Judy Feldman (me) and Trevor Mikula, called "Dapper and Posh." Personally, I think our work looks great together. We both love color and humor, yet our approach and techniques are different. 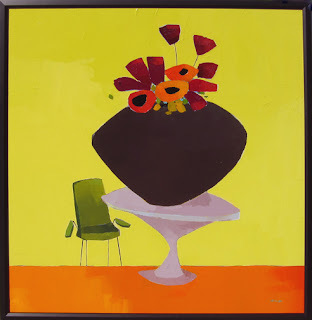 Trevor immerses his viewers into a world he creates by depicting funky characters and using geometric shapes and out-of-scale images, such as an oversized vase of flowers sitting atop a wobbly table about to tip over. He paints with a palette knife and uses a glossy finish to give his paintings a wonderful shine. 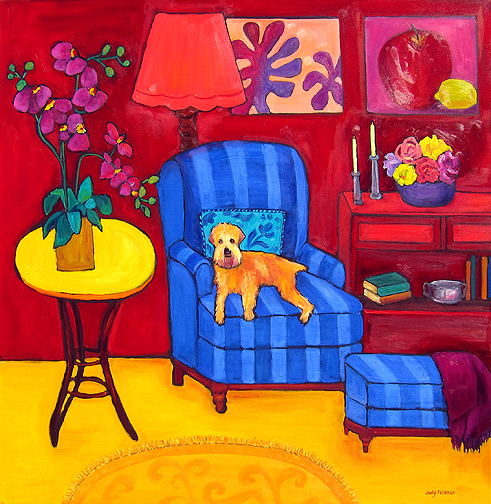 Trevor Mikula "Green Chair" acrylic on canvas 42"x42"
My paintings are colorful and playful, too. Often, I create an interior setting that evokes a place I'd like to be. And there's usually a narrative element in each painting. For example, in "Friends," a dog poses on his haunches in front of the mirror and sees his "friend" looking back at him. We know his owner has been there because she's left her shoes by her chair, both of which also are reflected in the mirror. I use a traditional brush technique, and often paint on a black gessoed canvas, which makes my colors pop. I love pattern - especially on chairs and pillows! Judy Feldman "Friends" oil on canvas 40"x30"
I use a traditional brush technique, and often paint on a black gessoed canvas, which makes my colors pop. I love pattern - especially on chairs and pillows! Wilde Meyer paired two of our paintings because they share a similar color palette. We each did a still life painting of a plant - in completely different ways, and they look really good together! "Dapper and Posh" is up until Wed. March 16, 2011. So stop by soon! The next show is "Wild Spirits" and starts on the 17th, and will feature Leigh Gusterson and Chaille Trevor. We're happy to announce that Judy Feldman will contribute as an author to our blog! 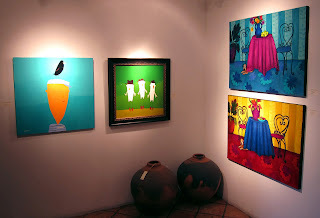 Wilde Meyer has been representing Judy's art since 2004. 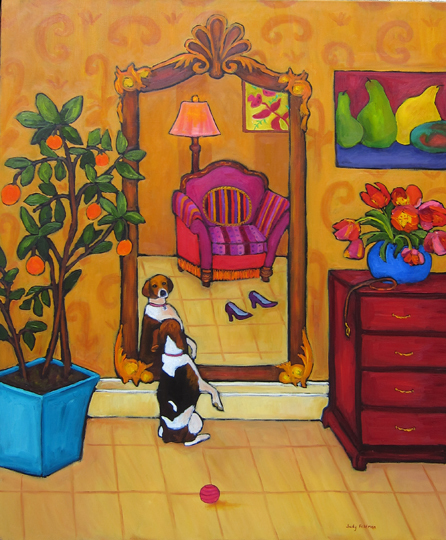 Though art has always been a part of her life, Judy comes to painting after a successful career in public relations. The first thing you will notice is that her paintings are very, very colorful! She is influenced by post-Impressionist art which she studied in France during college and she incorporates fauvists ideas and techniques in her paintings. See more of her work at her website here and ours, here.